20% off the first order; Discounts for return clients. This review has not yet been approved by the owner of this writing service. 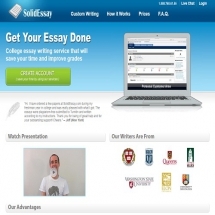 If you are the webmaster of Solidessay.com, please Contact Us to approve or remove this review. The website boasts of a fairly pleasant design and sensible structure. You don’t have to wade through tons of filler text to find a few lines of useful info scattered among them – the majority of filler is limited to sections of the site you don’t have a reason to visit, and almost all information about the site you may need is easily available. Prices here are quite pocket-friendly, at least when compared with many other services of seemingly the same level of quality. They start at $14.95 per page for a 5-day deadline and rise as high as $38.95 per page for a 6-hour deadline. However, one should keep in mind that what is considered a page here is noticeably smaller than normal – about 225 words instead of the usual 275 (in direct contradiction to the front page claim “over 300 words per page”). Prices don’t seem to be affected by anything but deadline. Customer support is available via online chat and phone. Either way, contacting it and getting a free operator to answer your questions may take a while, as they seem to be fairly busy. In case there are no available operators at the moment, you may leave a message so that they contact you at the earliest possible moment, but it is hardly a consolation when you need an answer urgently. The quality of writing presented in samples is poor to mediocre. While there are no obvious grammar mistakes, the working itself is fairly primitive and simplistic, perhaps suitable for not very discerning high school teachers but completely out of the question in college and higher up. Refunds are possible in case the order hasn’t been delivered at all or contains irrelevant content. All refunds are done at the sole discretion of the service, there are no clear-cut rules to this effect. All in all, SolidEssay.com looks, well, rather solid. Prices more or less on par with the industry average (perhaps a little lower), convenient website, carefully described company policies, a reasonable system of discounts – there is nothing out of the ordinary, but everything looks and feels well-established. Customer support could have been more efficient, though, and sample texts leave much to be desired, but not more so than 90% of what you can find on such sites.